Yesterday, Google released the fifth version of its popular freeware program, Google Earth. Once of the added features that has caught a lot of attention is the inclusion of Mars and Earth's ocean floor. The Mars addition is particularly fascinating, pulling data from multiple missions (MRO, MGS, Mars Odyssey, and Mars Express) to create a realistic Mars simulator. One of the best features of Google Earth is the flight simulator, which combined with the new "Google Mars", would allows users to fly down Valles Marineris. Though, if they are like me, they crash the simulated plane into the canyon walls. The new button that allows you to switch between Earth and Mars also seems to imply that other planets, perhaps moons, might be supported in the future. I would certainly love to see "Google Io". However, at this point, stereo data is pretty limited. But it would still be neat. 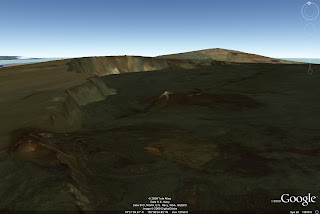 The image I used from Google Earth above shows the summit crater of Mauna Loa.